Hillsboro’s volleyball team returns these seniors and letter-winners as they gear up for a new season. Pictured from left: Taylor Helmer, Sienna Kaufman, Abby Sechrist, Trinity Malm, Sarah Jost and Alykah Dewees. With an experienced core group returning and a talented freshman class on the rise, Hillsboro volleyball coach Sandy Arnold is working to rebound from her team’s first losing season since her HHS debut season in 2004. Following a 12-27 season and a 2-8 record in the Central Kansas League in 2016, Arnold is hoping to lead the Trojans a few steps closer to their winning tradition. 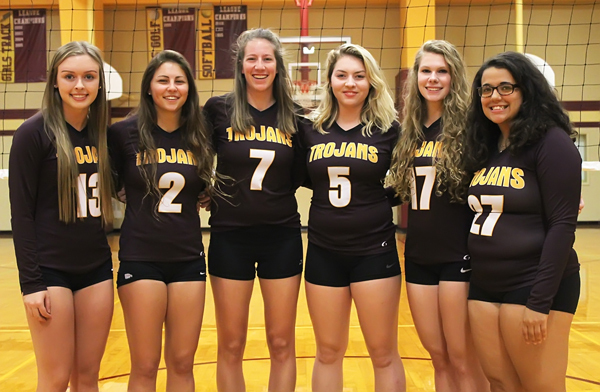 The Trojans’ path to success will be blending her core of five returning veterans with an influx of five talented freshmen who led last year’s middle school team to the league championship. On the court, their passing and serving skills will determine how successful the season will be. “We must be able to perform those two skills at a high level to compete,” Arnold said. Arnold’s returning veterans include four seniors: middle hitter Abby Sechrist (6-feet), outside hitters Sarah Jost (5-7), Sienna Kaufman (5-8) and setter Taylor Helmer (5-8), plus junior Trinity Malm (5-7) at outside hitter. Sechrist was an honorable-mention all-league selection a year ago. “Her definite strength is blocking, but she also has grown in her knowledge of the game, especially on the attack,” Arnold said. “She is starting to figure out where to hit the ball and put it on the floor, whether it’s a hard shot or a soft shot. That part is really coming along. Arnold calls Jost her team’s most consistent hitter so far this fall. Arnold envisions Kauf­man playing right-side hitter this fall. Helmer will be the team’s setter. Malm brings good serving, passing and hitting skills to the team, according to Arnold. Arnold said sophomore Megan Bechtold (5-8) has been pushing for playing time as backup setter and Addie Berens (5-9) has been showing solid skills as an outside hitter. Arnold said freshman Jessica Saunders (5-11) will be a starter as the season opens. “She’s probably going to be my other middle (hitter),” her coach said. “I’m not exactly sure if she’ll play all the way around, but I have another freshman who could play for her. Teegan Werth (5-6) is likely to see court time as situations dictate. Arnold said Tuesday Weisbeck (5-9) is another freshman pushing for playing time. “She hits the ball hard and she’s a tall girl who could provide a block,” Arnold said. Kinsey Kleiner (5-5) will likely develop her skills as a setter with the junior varsity, but shows potential to be the heir apparent in coming seasons. Arnold said mixing veterans with freshmen has the can challenge team chemistry, but it doesn’t have to. “The (veterans) who realize (the freshmen) can help the team are good with it,” she said. “It’s just how you respond to that. Are you going to get mad that they’re pushing you, or are you going to perform because they’re pushing you? As in previous years, Arnold doesn’t lighten the season schedule based on talent level. “We will continue to branch out this season, as we have scheduled matches with larger schools such as Great Bend and Emporia (Oct. 5), and at the Southeast of Saline (Sept. 9) and McPherson (Oct. 7) tournaments,” she said. The Trojan Invitational (Oct. 14) will again draw a challenging field. The host team could potentially face Andale, Rock Creek, Circle or Augusta. The 2017 season opened Saturday with the CKL preseason tournament hosted by Haven. The Trojans finished the day with a 2-4 record for seventh place. Hillsboro’s first home appearance will be Sept. 12 versus Halstead.